Still googling for all those useless tools that market your advertisements in the name of a utility software. Be it software for video conversion or just a screen recorder. Well, now is the time to get fooled by all those hoaxes. There is some original and authentic software that let you do all the tasks with ease and simplicity. Most appropriately, a tool that can compress and record videos and lets you save the files on the cloud, directly upload to YouTube and Social Media. ClipChamp is an app that does multiple video related tasks and directly reduces your workload and input. Today we’re going to test out all the features offered by this tool and how great is it? So without wasting time, let’s start the review of ClipChamp. Converts videos in Chrome directly on your device, using offline option. Input video files of different size and format. Record videos with your Webcam. Compress & Reduce file sizes of different videos. Works as a reliable MP4 converter, output videos in standard formats. 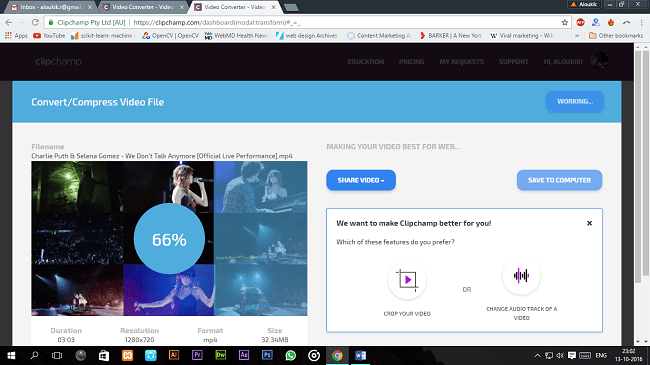 ClipChamp smartly integrates your browser with your device and saves all the recorded videos and compressed inputs offline in the media storage. All you need to is to download the software and the Browser extension on your computer. The files remain on your PC, and you can share them online on various platforms, cloud storage or YouTube. The more you’ll know about the functionalities of ClipChamp, the more you start using its different services. It has different products for different purposes. Neither an online converter website, nor a dedicated tool. ClipChamp offers an exclusive in-browser video converter plugin. You can preconfigure all the output settings and can keep things simple. The output videos could also be saved in different formats like MP4, WebM, FLV, GIF and different resolutions 240p, 360p, 480p, 720p HD and even Full-HD 1080p. 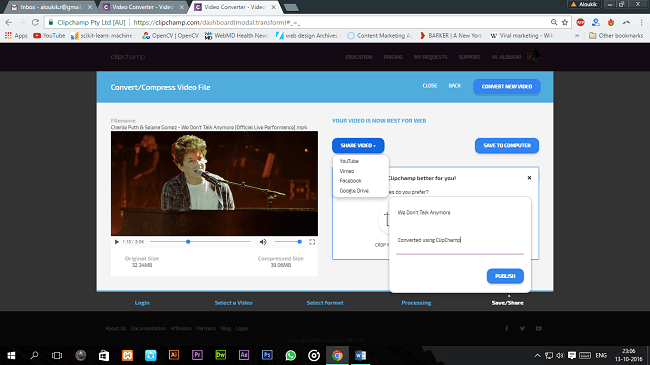 Apart from a video converting tool, ClipChamp also allows you to record videos on your computer using the webcam feature. The saved or recorded videos can be uploaded to various sites and cloud storage too. You can even upload the video directly on YouTube if you’re recording for such purposes. ClipChamp is a freemium service providing company. You can start using the converter and recorder for free by creating an account on the official website. 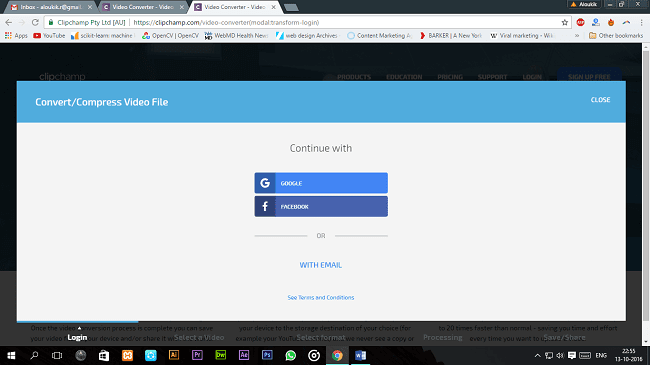 The site allows you to log in with social accounts, Google and Facebook or with the official Email sign-up. The in-browser converter/compression tool allows you to upload any video file from your computer and lets you compress its size, change the format or just reduce the input quality. You can also crop the video or change the background audio of the video file. After uploading the video, start conversion process starts automatically, and within few minutes you can have the reduced video ready for sharing. You can download the converted video output or just upload it across different video platforms like YouTube and Vimeo, or directly share it on Google Drive, Facebook, etc. So you can easily see that how simple it is to convert a video and compress its quality or size using ClipChamp. The interface of the website is very minimal, and the step-by-step process guides you through. Even though all the services provided by this site are pretty professional and premium, but still the company provides a trial version for all the customers to get a glimpse of all the performance oriented tools by ClipChamp. 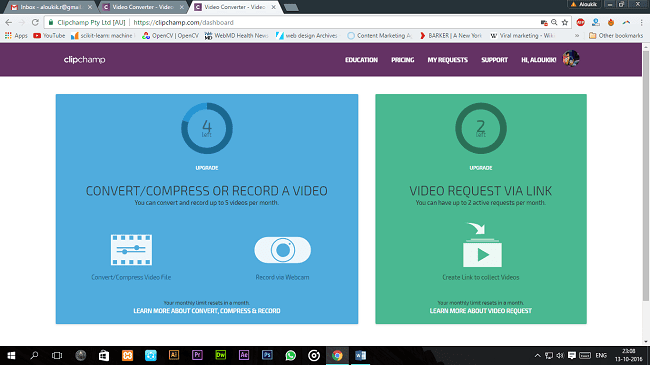 The video converter and compressor are only accessible for five users per month. In that time frame, you can convert different videos and can even record a video using the webcam feature. Moreover, you can also request two videos from the ClipChamp server for your personal use. If you’re not satisfied with the trial and want to use more of these exceptional services, then you can upgrade your free plan into a premium one for a standard cost. 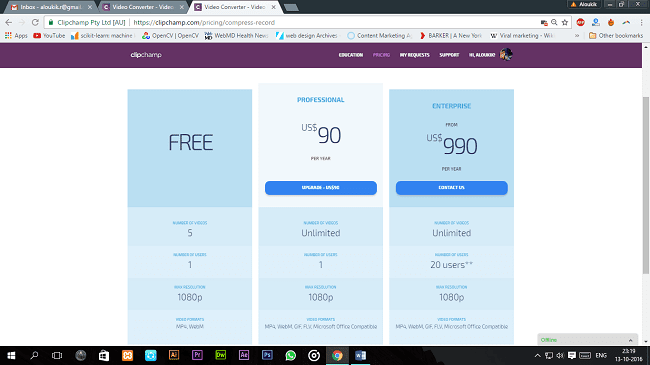 The pro version starts $9/month and offers you to convert, record unlimited videos, and download them in Full HD 1080p using ClipChamp. The services are restricted to only one user. For multiple users, the enterprise plan starts from $99/month and allows up to 20 different users to use the same account. The plans are also available on an annual basis, and you can get more information about the pricing here. At last, I’m proudly concluding that ClipChamp is a useful website and offers multiple video related tools all in one place. With ClipChamp, you can record a video, compress its quality or simply change the format of the video input. All the videos are social media ready, and you can directly share the compressed videos across different platforms. The company also offers a WordPress Plugin for website services. Do share your thoughts on the tool below and let me know if you’re using ClipChamp for any video conversion. How much do you love it? Would you recommend the paid version? Comment below. Cheers!